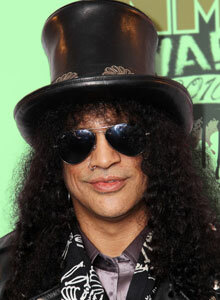 Slash Biography, Discography, Music News on 100 XR - The Net's #1 Rock Station!!! Saul Hudson, mainly known as Slash, was born on July 23, 1965 and was raised in Stoke-on-Trent, Staffordshire ENGLAND, until age 11 when his family moved to Los Angeles. Both his parents worked in the entertainment business, his mother being a clothing designer, she did some of David Bowie's costumes and his father being an art director for a record company. In the mid-'70s, his parents separated. He moved in with his beloved grandmother until he could sort out the situation at home. About this time the young Hudson discovered bicycle motorcrossing, joined up with a group of kids and rode with a passion. While in junior high school he got his first guitar; soon the bike was put aside and Slash devoted at least 12 hours a day to playing guitar. His schoolwork suffered when he skipped classes and sat in the bleachers all day playing guitar. The talented guitarist eventually got so tired of school that he dropped out in 11th grade. As he lived in L.A. 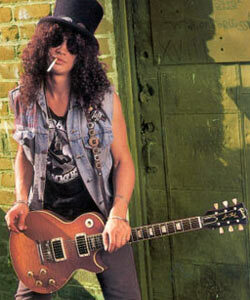 Slash met Steven Adler, formed the band Road Crew; then he met Izzy Stradlin who played in a band with Axl Rose. Soon a bass player, Duff McKagan, answered one of Slash's ads in the paper and in 1986 the group adopted the name Guns N' Roses, becoming one of the most celebrated Hard-Rock bands ever. 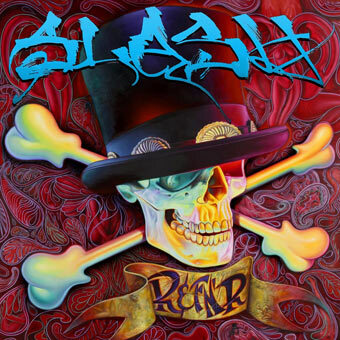 After the Illusions tours, the Gunners went on a well-deserved hiatus and Slash decided to form a side-project with vocalist Eric Dover, guitarist Gilby Clarke, bassist Mike Inez and drummer Matt Sorum: Slash's Snakepit. With the success of the band's first album, 1995's "It's Five O'Clock Somewhere", Slash told the public that Slash's Snakepit would be back again. During this time Slash and Axl Rose had talks about the musical direction of Guns N' Roses; the guitarist saw the band as a Rock outfit while Rose wanted to go in a more Industrial direction with the band. After many meetings and heated discussions, Slash resigned from Guns N' Roses in October 1996 with Rose retaining the rights to the band name. As promised, Slash brought back Snakepit in 2000 with "Ain't Life Grand" and one year later he announced publicly that Snakepit was no more. In early 2003, Velvet Revolver was formed by the members of Guns N' Roses, Slash, McKagan and Sorum, singer Scott Weiland from Stone Temple Pilots and guitarist Dave Kushner; the group's double-platinum debut, "Contraband", was followed by "Libertad" in 2007. But in the spring of 2008, Weiland parted ways with the band and has since reunited with Stone Temple Pilots. Slash released his first true solo album, simply entitled "Slash", in early April 2010. The disc featured an all-star roster of guest musicians, including Chris Cornell, Dave Grohl, Myles Kennedy, Kid Rock, Lemmy Kilmister, Adam Levine of Maroon 5, Duff McKagan, M. Shadows of Avenged Sevenfold, Ozzy Osbourne, Iggy Pop and Andrew Stockdale of Wolfmother, whose vocals feature on the album's first single, "By The Sword" which went a bit beyond the top 20 of the Active Rock list; the second single, "Back From Cali", was sung by Myles Kennedy and was another top 30 hit on the same chart. The album quickly blazed up the American charts with a peak position at #3 in U.S. and #1 in Canada; it was also well received by fans and critics alike in Europe and Australia. "Apocalyptic Love" was the title of the artist's second solo outing released via his label Dik Hayd International along with distribution through EMI in May 2012. It debuted at #4 on The Billboard 200. 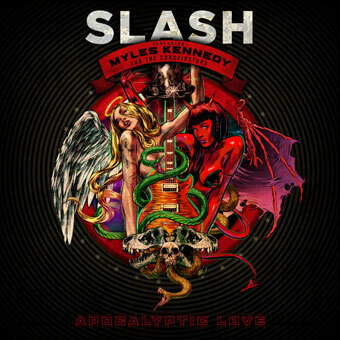 Joining Slash on "Apocalyptic Love" were Myles Kennedy and The Conspirators, Todd Kerns on bass and Brent Fitz on drums.